David Carter is the creator of incredible pop-up books. They are imaginative, interactive, ingenuous, and irresistible. The Pop-Up Artist from Manny Crisostomo on Vimeo. So many Science Fiction books – and I am counting Hunger Games and all that genre in the Sci Fi mix, someone will probably see fit to argue with me, but I am resilient and capable of defending my stance – so little time! 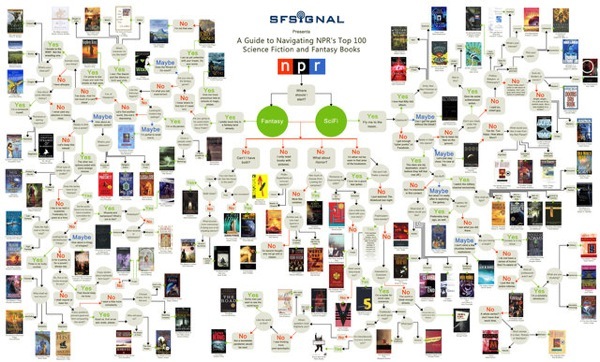 If you thought Science Fiction and Fantasy weren’t really your thing then this helpful chart might be just what you need to get started on the genre which is so hot right now. Sadly despite studying this chart for rather more time than I am going to admit to, I cannot find Mary Doria Russell’s The Sparrow. It would fit, maybe over by the politics, religion, philosophy etc. section with Ursula le Guin and co. This is interesting. A TED talk about a new kind of school which is being developed in Britain. For 14 year olds and over it seems – if you believe the pitch below – to be doing great things for the students. This is a great new initiative by Simon Evans and some of his friends from various locations around the world. It is the sort of thing that you could do as a promotion for library week. You have to make a commitment to reading a book a week and videoing yourself talking about the book and post to the Bookfighters channel on YouTube. Simon then created his own channel which is here. How cool is that? I’m thinking this has possibilities for school libraries. Have a look at the Channel and watch the videos, the introductory one is embedded below. Confession time for Gweneth Jones The Daring Librarian, and therefore we can now all be free, confess our sins and get on with stuff. Wikipedia – we have been fighting the good fight against it in our schools for years, but if we were all truly honest we would admit that we all use it for quick and dirty information. We use it with a skeptical eye … our students just use it! We really just need to teach them some critical literacy skills and then set them free. After all Information wants to be free doesn’t it? We want information to be free, I for one don’t have the budget to pay for online encyclopedias and I encourage our students to use Epic. Wikipedia helpfully makes information free, and probably the majority of it’s information is fairly sound. It is true that it ain’t always right, and if someone out there has an example of an incorrect wikipedia posting I’d love to have the link to it (please) comment to share it. Here is an ugly link to some examples of articles in Wikipedia which are not right – but I want more please, everything I’ve found siting incorrect information on Wikipedia is dated between 2005 and 2008. There are plenty of examples of bias, but not many where people can site facts as being incorrect. They must be there. Anybody? I’ve read the book The know it all, about A.J. Jacobs and his quest to read Encyclopedia Britannica from A – Z, and yes folks he found mistakes and errors, proving that even that hallowed tome is fallible. So, read the article. Think about subscribing to the RSS feed. And also the RSS feed from The Daring Librarian blog so you don’t miss out on other good stuff. Then head to here to access a fabulous graphic about teaching students to use Wikipedia skillfully to get what they need. In the ‘Oh Crikey This Is So Cool Department’, this is a fabulous and very clever Italian made video. Enjoy. It came to me from Flavorwire. Site of so much awesome. I’m completely unsure how useful this would be, but I really like it. This is the We Solve It Question Generator. It is a cute gizmo which you use for generating questions when students are doing inquiry research. Click the spin button and the words whirr around and hey presto you get a two word question. So, how much? Who can? When would? How do? This ain’t rocket science but it is jolly cute and might be a bit of cool fun on a data projector for brainstorming, or even at a party playing 20 questions! Share with your staff.